We know that every smile is unique, and kids especially have a unique oral health needs. One of the ways we address safety and comfort when caring for your child’s smile is by incorporating sleep dentistry into our practice. 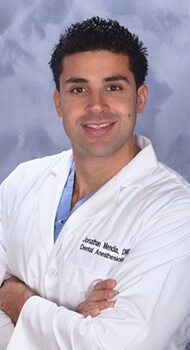 Dr. Jonathan Mendia is an experienced dental anesthesiologist with advanced training and experience to make your child’s dental care safe, comfortable, and free from stress. Dr. Mendia earned his doctor of dental medicine from the University of Pittsburgh School Medicine. He has also completed advanced training in dental anesthesiology. When he's not helping your kids get the dental care they need, Dr. Mendia also works as an associate clinical professor and anesthesiologist at the Rutgers University School of Dental Medicine.